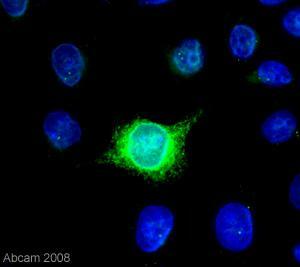 This antibody recognizes ADAM17, but does not react with other ADAMs. ab39163 reacts with an epitope located in the activation site (cysteine switch and furin cleavage site) of ADAM17. Synthetic peptide based on the activation site (cysteine switch and furin cleavage site) of human ADAM17. Our Abpromise guarantee covers the use of ab39163 in the following tested applications. WB 1/1000 - 1/5000. Detects a band of approximately 120 kDa (predicted molecular weight: 93 kDa). 1/1000 (when using colorimetric substrates such as BCIP/NBT) and 1/5000 (for chemiluminescent substrates). Higher concentrations of antibody may be needed for samples from more distantly related species. Detects a band of approximately 120 kDa in reduced Western blots of conditioned media or cell lysates, which is converted to a 55-60 kDa band.Note: EDTA/EGTA treatment of tissues or lysates is required to see latent zymogen. 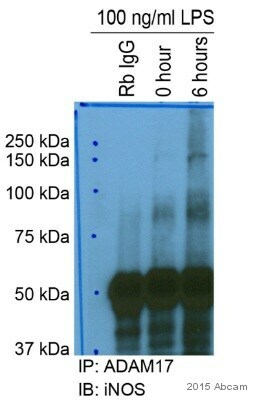 Dilution optimised using Chromogenic detection. Cleaves the membrane-bound precursor of TNF-alpha to its mature soluble form. Responsible for the proteolytical release of soluble JAM3 from endothelial cells surface. Responsible for the proteolytic release of several other cell-surface proteins, including p75 TNF-receptor, interleukin 1 receptor type II, p55 TNF-receptor, transforming growth factor-alpha, L-selectin, growth hormone receptor, MUC1 and the amyloid precursor protein. Also involved in the activation of Notch pathway. Must be membrane anchored to cleave the different substrates. The cytoplasmic domain is not required for the this activity. Only the catalytic domain is essential to shed TNF and p75 TNFR. Phosphorylated. Stimulation by growth factor or phorbol 12-myristate 13-acetate induces phosphorylation of Ser-819 but decreases phosphorylation of Ser-791. ab39163 detected ADAM17 protein in lysates of the highly invasive human breast cancer cell line MDA-MB231. ab39163 was incubated at a dilution of 1/4000 for 16 hours at 4°C in PBS + 5% Milk. For further details please refer to the Abreview. The image shows ab39163 detecting mouse ADAM17 expressed in transfected HeLa cells. The cells were fixed in methanol and incubated with 10 µg/ml ab39163 for 1 hour at 20°C. 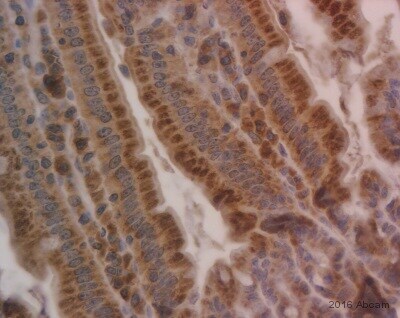 Ab39163 staining human normal colon tissue. 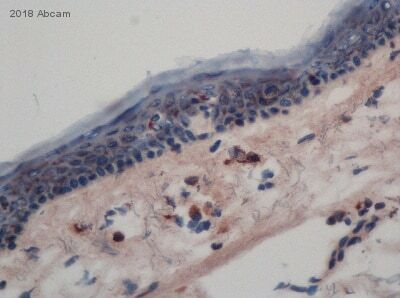 Staining is localised to cellular membranes. Publishing research using ab39163? Please let us know so that we can cite the reference in this datasheet. Can you tell me more about the molecular weights? Three human ADAM17 sequences encode proteins with different Cytoplasmic domains, as is the case for other ADAMs proteases. The 824 amino acid sequence encodes a 92,960 Dalton protein, the 807 AA sequence 91,003 Dalton, and the 694 AA sequence 78,543 Dalton predicted MW. Glycosylation and other posttranslational modifications increase the apparent molecular weight on PAGE gels. Mouse and rat ADAM17 sequences are both 827 AA, predicting 93,073 and 93,017 Dalton proteins, respectively. This product recognizes a 120 kD band in reduced Western blots of conditioned media or cell lysates, which is converted to a 55-60 kD band. Thank you very much for your inquiry. The amino end of ADAM-17 is processed by furin-like proteinases during maturation of the protein. The Carboxy end is also cleaved by different proteinases, and the amino end is further cleaved as well. The ab39163 ADAM-17 epitope is after the furin cleavage site, within the range of the catalytic domain. Most of the glycosylation occurs in the propeptide domain, so a larger than expected size might be ADAM-17 with intact carboxyterminus. This has not been experimentally tested. I hope this information is helpful. Please do not hesitate to contact me again with any further questions. I have been using your rabbit polyclonal against the propeptide domain of ADAM17 to examine an ADAM17 prep and get no recognition with it at all whereas your other Abs (ab39163 and ab28233) are fine. 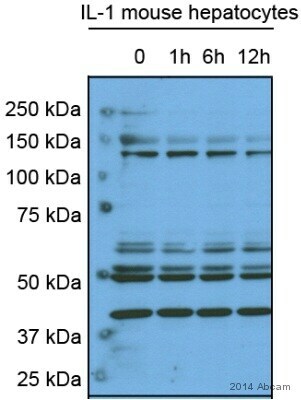 I think my protein has been cleaved following Arg58 in the propeptide domain and I suspect that your Ab has been made against a peptide within the missing N-terminal 58 amino acids. Is this correct? Also, for the activation site Ab (ab39163) is only the intact site recognised or if after cleavage are both sides recognised or only one? you are correct in assuming that ab39161 recognizes only the prodomain cleaved during ADAM17 maturation. This maturation can be prevented using divalent metal chelators such as EDTA or EGTA. One of the customers who submitted an Abreview for ab39163 noted that "Seems to be selective for Precursor forms of ADAM17". The presence of the 55kDa band as well would indicate that both the cleaved and uncleaved form of this protein are recognized. I have another question with your antibody ab39163, on your data sheet said "WB: Recommended starting dilution of 1/1000 (when using colorimetric substrates such as BCIP/NBT) and 1/5000 (for chemiluminescent substrates). Higher concentrations of antibody may be needed for samples from more distantly related species. Detects a band of approximately 120 kDa in reduced Western blots of conditioned media or cell lysates, which is converted to a 55-60 kDa band. (Predicted molecular weight: 93 kDa). Note: EDTA/EGTA treatment of tissues or lysates is required to see latent zymogen. Dilution optimised using Chromogenic detection. Not yet tested in other applications. Optimal dilutions/concentrations should be determined by the end user.". Why can 120kD become 55-60 kDa ? Thank you for your enquiry. Regarding the difference in detected molecular weight, glycosylation and other post-translational modifications increase the apparent molecular weight of ADAM 17 to 120 kDa, and cleavage at the aminoterminal end results in lower molecular weight forms, therefore producing the 55-60 kDa range. If there is anything else I can help you with, please do not hesitate to contact me.